Create high-quality YouTube HD videos that sound amazing with the Focusrite iTrack Pocket iPhone Video and Audio Recording Dock. 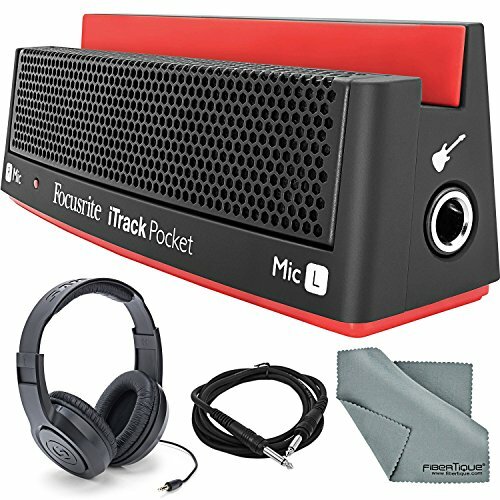 The i-track pocket recording dock is designed for the professional enthusiastic singer-songwriter. It features a front-facing stereo microphone and 1/4” Hi-Z input with built-in amp simulation for connecting a guitar. With Focusrite’s free Impact app you can apply professional audio effects including guitar amp simulations, as well as master your captured song, then upload it straight to YouTube. Use the included Lightning cable to connect to any lightning compatible iPhone and let the iTrack Pocket find the perfect setting for the clearest possible recording. The iTrack Pocket is compact and portable so you can use it everywhere you take your phone to capture musical performances that will sound as great as they look and inspire your YouTube subscribers once again. Samson Stereo Headphones - Offer great sound and feature a lightweight, closed-back design with an adjustable headband that will provide a comfortable listening experience for any user. Front-facing stereo microphone for higher-quality audio than i-phone's built-in microphone. 1/4" Hi-Z input with built-in amp simulation for connecting a guitar. Free Focusrite Impact app lets you apply professional audio effects and upload it straight to YouTube. Connect to any lightning compatible iPhone with included Lightning cable. Fits in your pocket - use it everywhere you take your phone to capture musical performances that will sound as great as they look. View More In Audio Interfaces.